XIRO XPLORER V Review – Discover the Sky with this Futuristic Drone! Hello fellow drone lovers and welcome back to another great review here on DronesWorld! As always, we aim to bring you the most updated and valuable drone information possible. Our goal is for you to always get the best value for your money. With this in mind, today we are reviewing a quadcopter released back in 2015, the “Good Design Award 2015” and “2016 Red Dot Best of the Best Award” winner, the beautiful XIRO XPLORER V. This drone as a very futuristic look and has in my opinion one of the best designs in the market. Without further due let’s move on to its review. As mentioned in the introduction of this review, XIRO XPLORER V is considered by many to be one of the better-looking quadcopters currently available in the market. In fact, it has already won two Design awards in the past. This futuristic black and green design truly makes XPLORER V stand out from the rest. Besides the good looks, XPLORER V is made off one of the strongest type of materials used on drones: carbon fiber. This highly resistant material will ensure the quadcopter doesn’t break or bend easily, enduring most crashes and hits. However, this doesn’t mean that you should be careful. 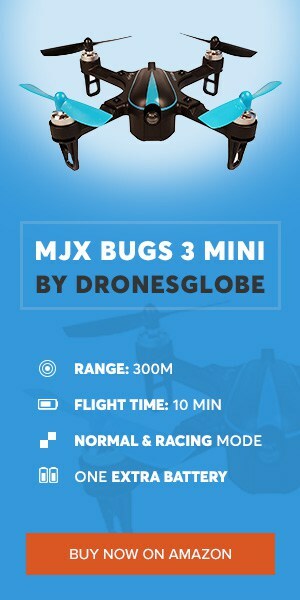 XIRO XPLORER V flies at a speed of 8m/s, and if you crash against a wall, tree, or other object at full speed, you may damage the quadcopter a bit. Fly safe! XIRO XPLORER V quadcopter packs a decent quality camera, not one of the best drone cameras currently in the market but still slightly above average. This XPLORER V model comes with a 14MP 1080p HD Camera mounted on a 3-axis gimbal. The pilot can tilt the camera through the remote controller, therefore allowing different view angles. Camera provides a decent quality even at night, because the Panasonic CMOS image sensor captures great pictures even in low-light conditions. The 14MP camera shoots 1080p video at 30 frames per second and 720p footage at 60 frames per second. The files are saved in QuickTime format and can be accessed later after flight. XPLORER V is also capable of transmitting live video through its built-in Video Wireless Transmission. It transmits live video directly to the pilot’s device (smartphone or tablet) through a free to download the application (available for both Android and iOS). The Live Video is transmitted via WiFi. Pilot can also select photos to wirelessly download to his mobile device. The pilot can enjoy immediate access to share his photos and videos online, with no connection to a computer being required. XIRO XPLORER V comes with a great set of features. First of all, it has automated landing and take-off. This means the drone will automatically take-off with just the push of a button on the remote controller and begin hovering steadily in air waiting for further pilot’s input. Same button will order XPLORER V to automatically land. It is always a useful and fun feature, but it doesn’t stop here. XIRO XPLORER V has more automated features such as Return to Home, thanks to its inner compass that memorizes the drone’s position. With the press of a button this quadcopter will safely and automatically return to where it began flight. If you are worried about losing or crashing your drone, worry not. XPLORER V has a safety feature that activates whenever the drone runs low on battery. When battery is low, the drone will automatically return to pilot, therefore avoiding crashes due to no battery. Another useful feature on XPLORER V is the IOC (Intelligent Orientation Control), somewhat like Headless Mode, it will make the drone easier to control thanks to, once again, its inner compass. Oh wait, we got more! XIRO XPLORER V also provides more features through its mobile app. Within this app you can select an object and drone will track and follow it, while recording. This is very useful for getting that one perfect shot without any hassle. The app also allows for the pilot to pre-program a flight path with up to 16-waypoints which enable the drone to complete the flight path by itself. Once again, an extremely useful feature to have. As you can see, for a drone within this price range, it still has a lot of powerful Automated features. XIRO XPLORER V comes with a smart control with excellent grip. Very intuitive and compact this 5.8Ghz remote controller has surprisingly comfortable tactile silicon and vibration signals, truly enhancing the flight experience. The Smart remote controller has three flight levels and three features buttons (1 for IOC, 1 for Auto Return Home, 1 Auto Take-off, and Landing). The remote controller also includes a phone holder for the pilot to place its smartphone (up to 5.5inch phone) and provide a better flight experience. A somewhat negative aspect of XIRO XPLORER V, in my opinion, is the maximum range. XPLORER V only has a maximum control distance of 500 meters, slightly less than other drone within same price range. However, 500 meters is still enough to get the most out of this quadcopter while recording good quality footage without any hassle. XIRO XPLORER V is powered by a 1.1V 5200mah Lithium smart battery that provides up to 25 minutes of flight time. Of course, the flight time always depends on flight conditions and amount of weight on the quadcopter. Keep mind that you can always purchase an extra battery if you wish to fly during more than 25 minutes. However, I advise you to let the motors of the drone cool off between battery exchanges. If you switch batteries and resume fly right away, with time this may damage the motors. Is XIRO XPLORER V Worth Buying? What are the Pros and Cons? That depends on your budget and needs. Overall, this is an amazing quadcopter, certainly one of the best among its price range. It has a great set of features, a decent 14MP 1080p camera, and all you need to fly right out of the box. No assembling needed. Compared to other same price drones, XPLORER V has less control range, more flight time and more smart features. The camera is also within average, considering the price of the quad. It is correct to say that XPLORER V is a great value for your money, but everything depends on your needs and, of course, budget. THE GOOD XIRO XPLORER V has a useful and fun set of features, great for camera lovers seeking to explore the area. The camera is good quality and captures good footage even at night. Flight time is an amazing 25 minutes. The design of the quadcopter is also very impressive and stands among the crowd. THE BAD XPLORER V has a slightly below average control range, other same price drones fly longer distance. BOTTOM LINE Overall, XIRO XPLORER V is a great value for your money, a powerful and good-looking drone. Capable of recording good quality footage without any hassle to the pilot. It also transmits live video directly to the pilot’s mobile. XIRO XPLORER 5 is a great flight experience and surely will not disappoint you. What do you think of XIRO XPLORER V? Do you consider it to be one of the best drones? Let us know in the comment section below, we at DronesWorld love to read your comments and get in touch with you. Happy flying!